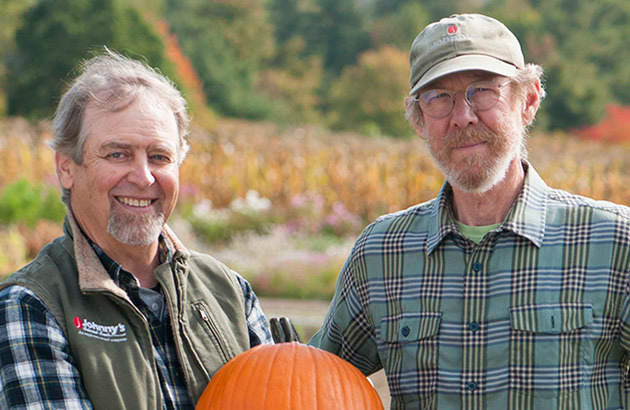 Albion, Maine: October 2, 2014 — Johnny's Selected Seeds warmly welcomes Dr. John Navazio, veteran plant breeder, agroecologist, author, and organic seed production specialist as manager of its plant breeding program. Dr. Navazio is a natural fit for Johnny's, renowned for its prodigious introduction of traditionally bred, award-winning new crop varieties to direct-market growers and avid home gardeners. Dr. Navazio, who holds a PhD in plant breeding from the University of Wisconsin, brings fresh vision and a wealth of vegetable expertise to Johnny's research initiatives. Widely respected as a progressive leader, educator, and mentor to the sustainable agriculture movement, Dr. Navazio has spearheaded such crucial goals as developing crop varieties adapted to minimal-input and organic production systems, working with farmers on participatory breeding projects, and generously imparting his encyclopedic knowledge of organic seed production to farmers. The foundational field work carried out by Dr. Navazio has helped to enhance the genetic breadth in vegetable crops to improve their nutritional value, flavor, texture, nutrient-scavenging capability, weed competitiveness, disease resistance, and cold tolerance. The participatory breeding projects he has developed with growers across North America have generated ongoing improvements in crop germplasm for farmers interested in strengthening regional seed systems. With a career path that clearly aligns with Johnny's long-term breeding goals, Dr. Navazio sees "an incredible opportunity in taking on the landmark traditional breeding work led for over four decades by Rob Johnston," Johnny's founder and CEO. "Some of North America's most important crop germplasm is being housed and developed right here in Central Maine. Most of my life's work has been in helping growers meet the challenges they face by breeding varieties from robust, genetically diverse germplasm that we identify as being better adapted to a range of environmental demands and under cropping systems that use less intensive inputs. The mark of success of this breeding work is measured by whether the grower's crops are more productive and healthy — even when conditions are less than perfect." Dr. Navazio and CEO Rob Johnston have been friends and colleagues for over 30 years. "Rob has always been avidly interested in what the very most progressive, most innovative direct-market growers are striving for. He has always sought to bring growers the best possible seed genetics — both in terms of the strong 'workhorse' varieties that perform across diverse climatic conditions and scale, as well as the hard-to-find, specialty varieties that give entrepreneurial growers a strategic edge in differentiating their market niche." Dr. Navazio has taught numerous classes and workshops on commercial-scale organic seed production, and is the author of The Organic Seed Grower: A Farmer's Guide to Vegetable Seed Production . He was a senior breeder at the Alf Christianson Seed Company in charge of spinach, beet, and carrot breeding before co-founding the Organic Seed Alliance in Washington, where he also had a joint appointment with the Washington State University as an Extension Specialist for organic seed production. John also previously served on the faculty of the College of the Atlantic in Bar Harbor, Maine and Prescott College in Arizona, where he taught courses in Ecological Agriculture and Plant Breeding for Sustainable Systems. As a plant geneticist, Dr. Navazio has directed his research and teaching toward the integration of organic farming methods with breeding crops, to minimize external inputs and improve resistance to the environmental challenges of the 21st century.